I am cookie challenged. I can bake up a storm, and I have a good handle on pie crust, but when it comes to cookies, I can make a disaster out of few good ingredients. These Twix cookies are a good exception to the rule, but when my son needed Valentine's Day treats, my poor husband ended up at the market close to 9pm as I scraped what looked like chocolate brittle off a baking pan. Anywho, these little gems are perfect and SO easy! Crisp on the outside, chewy on the inside. 5 ingredients and 30 minutes and voila - gorgeous little cookies! 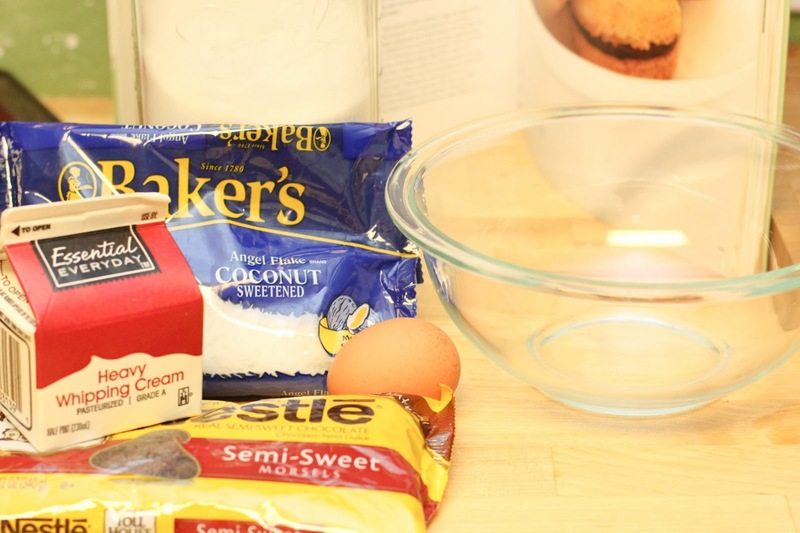 In a medium sized bowl, mix all cookie ingredients. The coconut mixture will be loose and seem kind of dry. Roll a tablespoon at a time in your hands until the coconut sticks together. All of a sudden it will seem much more wet. Place the ball on a parchment or silpat covered baking pan and press the ball to flatten it. Bake cookies for 15 minutes and then flip carefully. Bake another 3-5 minutes until golden and toasty all over. While cookies bake, make the Chocolate Ganache. In a small pan, heat 2 tablespoons of heavy cream until steaming, but not quite boiling. Turn off heat and add in chocolate chips. 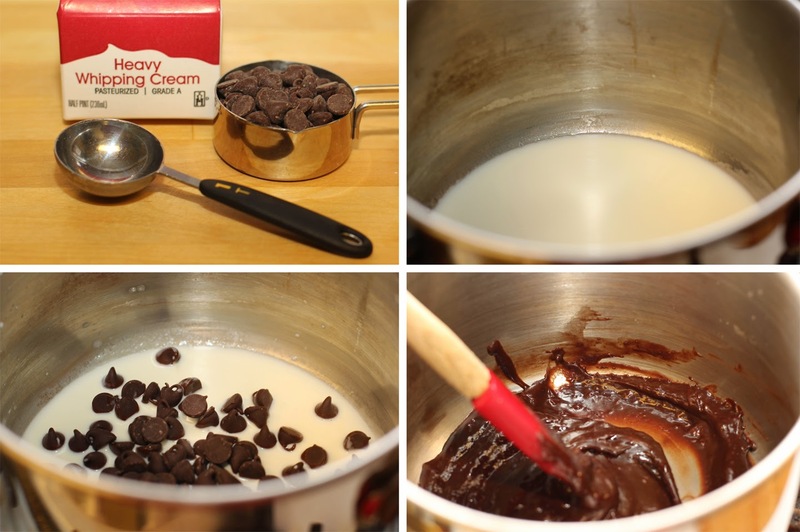 Let the chips sit in the hot cream for at least two minutes and then stir to melt. Let the chocolate cool until warm. When the cookies have finished cooking, let them cool on the baking pan and dollop on the chocolate. Let the chocolate cool and enjoy!! 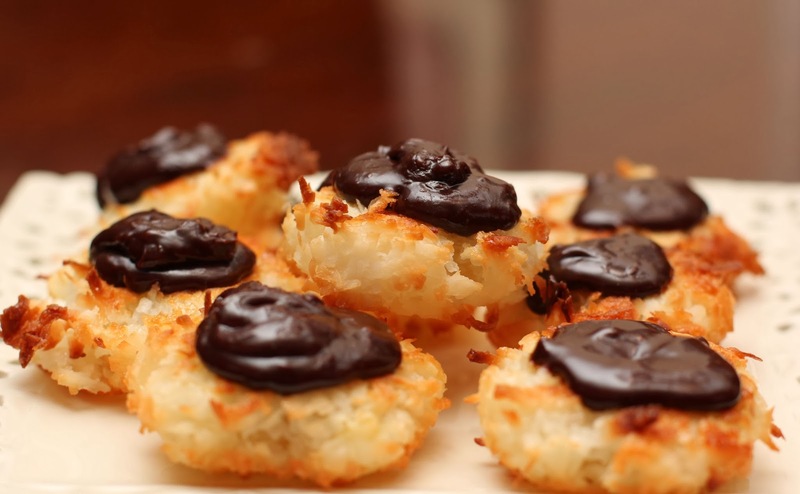 The original recipe calls these cookies macaroons - but I'm not able to make them thin enough sandwich. Sometimes you feel like a nut, sometimes you don't! Some slivered almonds on top of the chocolate is amazing. 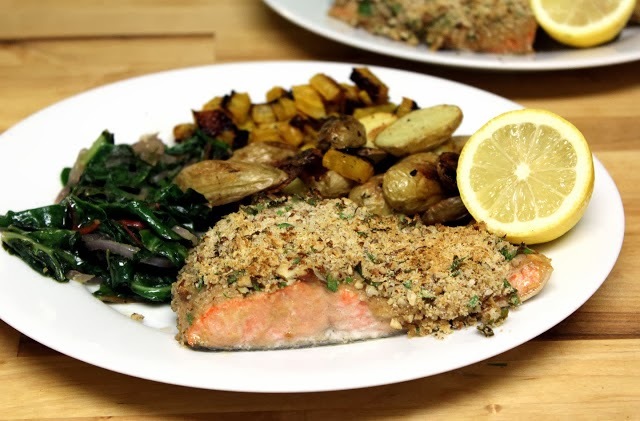 Pecan Crusted Salmon - oh my goodness this is good! Bacon and Cheddar Quiche - breakfast, lunch or dinner - awesome!